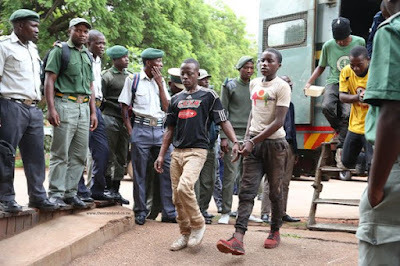 Eighteen protesters who allegedly invaded and caused damage to a police in station in Marondera on Thursday appeared before magistrate Ignatius Mugova facing charges of public violence. The accused who were represented by Marondera lawyer David Dhumbura, a member of the Zimbabwe Lawyers for Human Rights, were denied bail and ordered to return to court tomorrow. According to court papers, on January 15, at around 11am, the accused persons were acting in connivance with other accomplices who were gathered at the corner of Nyaguwe Road and Chikomo Drive, Dombotombo in Marondera. They allegedly barricaded the road with stones and started burning tyres while throwing stones at police officers. They were part of mobs who were demonstrating against the recent hike in fuel prices and general economic hardships in the country. The accused persons advanced towards ZRP Dombotombo Police Station while throwing stones. They allegedly broke into the police station and ransacked all the three station offices destroying furniture, criminal records and stole property which included cellphones, riot shields, helmets, hand held radios, base station radio, baton sticks, an HP laptop, cash, police riot gear, tear smoke canisters and bicycles. The accused also allegedly assaulted police officers on duty who sustained injuries. The 18 were later arrested when police and other security reinforcements were called. The total value of the damaged and stolen property is approximately $30 000.